Are you frustrated with your public school, can’t afford a private school, or just heard a lot of people take about homeschool and are wondering should I homeschool my kids? Let’s dive into this together! First of all let me tell you that you are not alone. Every parent out there has at one point questioned their educational choices for their kids. We all want what is best for our kids so we put a lot of thought, time, and research into those choices. Whether your kids go to public, private, or homeschool you will question your choices at some point. Secondly, your family is unique. I do not think that there is one perfect education option for everyone. Each family is unique. Your KIDS temperaments, abilities, interests plus YOUR abilities, availability, resources, and your community all factor into the best decision for YOUR unique family. we parents all make the best choices we can for our kids, not perfect and not all alike, but the vast majority of us are driven with love and best of intentions. Okay, now that we’ve got that out of the way….let’s dive into some things for you to think through as you consider if your family should homeschool. That may seem like a silly question, but if you really don’t want to spend the time (yep it takes time), expend the effort (it’s not all field-trips and reading books in the backyard), follow through, and extra character molding required to homeschool? If you really don’t want to – please DON”T! If your public school is bad consider a charter school, move to get to a new school district, apply for scholarships at a local private school, etc. Homeschooling is a commitment, hard work, and a life style for sure. So Should I Homeschool my Kids – only if you are all in! Are you able to Homeschool? If you taught your kids to use the potty, put on their shoes, and follow directions you already have the most essential building blocks to teach your kids! You don’t need a fancy certificate to make you a good teacher! You will be more invested in your child’s education, have more individual attention and direction than any school will be able to offer your child. your own academic success (i.e. did you finish high school, college, do you know how to study, can you write a good essay, can you balance a budget, etc.) – if you are going to teach these things you need to have at least a basic mastery of these things! do you have the finances – while you can homeschool for practically nothing (using sites like ours!) there is a financial cost if you have one fewer parent working plus especially as your children get older you will need to buy textbooks, supplies, and pay for enrichment opportunities (music lessons, art classes, gymnastics, etc.) Personally I average $500/year per child including our textbooks and an additional activity a quarter. Homeschooling has a way of magnifying your current relationship with your kids. It shouldn’t be a surprise to us – after all it means they are going to be with you pretty much 24/7 on top of needing to take instructions from you. But for some reason it catches many families by surprise. If your kids are sarcastic – they will become more sarcastic. Does that mean you shouldn’t homeschool unless you have perfect kids (which just in case you didn’t realize – none of us have)? Not at all! Homeschooling is a wonderful opportunity to build into the character of our children in a way that no other educational choice gives us! You get to use teachable moments that occur all day long to reinforce godly character in them! Chances are, if you stick with it and persevere, you will have a happier, more bonded family that enjoys spending time together and kids that you are proud of! Will my kid be Hermits? No your kids won’t be hermits! Don’t you remember your school teacher telling you to stop talking with the kids next to you because school time was time to learn and not socialize! Irony that parents are now worried they will miss out on those scoldings, being shuffled around from class to class with kids of the same age, trying to remain under the radar in the lunch room, etc. Homeschool kids tend to be incredibly social! They learn how to talk to kids of all ages (younger siblings, adults in the community, and grandparents) in their home and communities. Many homeschoolers take on service projects as a family (because they have the gift of flexibility and time)! Plus most homeschoolers have coops, field trips, park play dates, church socials, and more build into their schedule to allow plenty of time to foster deep, meaningful friendships with other kids their age. And without the fear from those negative encounters at school many homeschoolers are very confident and eager to befriend anyone! You just might raise the most confident social kid, all because you homeschooled! 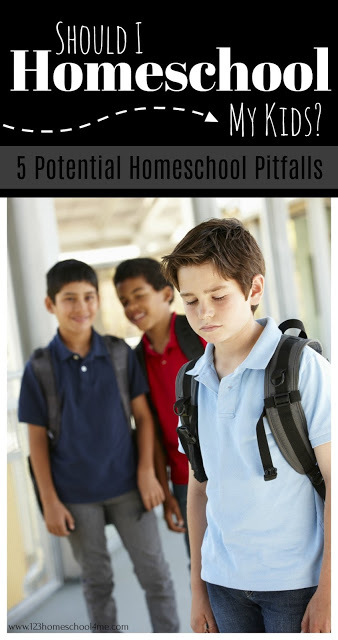 If you made it through these potential homeschool pitfalls and are thinking homeschooling just might be okay, let me share Why we LOVE Homeschooling to help you go from that would be okay to I’m excited to homeschool my kids!